The hot and humid weather and the threatening thunder storm didn’t stop the crowds from attending MCA-I New York’s First Documentary Film Festival. 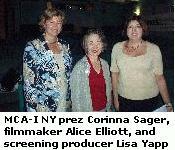 The screening room at Goldcrest Post Production in Greenwich Village, New York City was filled with members and selected guests for this special event produced by MCA-I NY member and FOCUS film critic Lisa Yapp. It was one of the few times that these films, all Oscar-nominated for Documentary Short Subject were shown together and the membership was thrilled to finally see what it takes to be an Oscar contender. After the screenings, Alice Elliott, the filmmaker who devoted five years of her life to her film, The Collector of Bedford Street, took audience questions along with Larry Selman, the subject of her bittersweet film, who was on a speakerphone. The first two films were: Mighty Times: The Legacy of Rosa Parks and Why Can’t We Be a Family Again?. Shown back-to-back they illustrated the diversity of techniques used to tell a story. Mighty Times relied on using actors to re-enact many of the scenes. Whereas Why Can’t We Be a Family Again? simply told the story of two kids with a Mom on crack and how their greatest hope, to be a family again, may never be realized. It was clear from viewing these exceptionally crafted, moving films why they were singled out for Oscar consideration. The third film, The Collector of Bedford Street, presented a humane and often humorous portrait of the mildly mentally-challenged Larry Selman who, despite his own poverty, has spent many years collecting money for a variety of charities, and how his precarious situation rallied a block association to do something ground-breaking for him. After the screening, a very amiable and articulate Alice Elliott was flooded with questions from the audience. After moderating an engaging Q & A with Mr. Selman by phone (he was feeling a little under the weather and couldn’t attend the screening in person, as planned), she answered questions on everything from initiating a project to editing and distribution. As a filmmaker, she says, she spends about ninety percent of her time on production chores (i.e., raising money) and ten percent as a director. Ideally, she would like to improve that mix and find a producer so that her time might be more evenly divided. She suggested that the best approach to getting a project going is to just start filming! Then deal with raising money. She started by borrowing a home video camera from a member of her block association. When she started she only had a gut feeling of the story she was trying to tell but she kept at it – sometimes not shooting for several months and then resuming. When it came to editing she only had a basic editing program on her home computer – one that isn’t even made anymore. She edited small segments of the film to get a feeling for which theme might emerge as the major storyline. She says that even cutting a rough trailer comprised of footage you may eventually not use can be enough to secure a grant or interest an investor. She shot over 100 hours of tape and says the film cost about $200,000 to make. As an actress turned filmmaker who did not go to film school, she could only go so far with the editing. So, part of her budget was allocated to a more seasoned editor to give the film its final shape. She always knew that she wanted to make a short documentary and not something feature-length. She says that often the short docs get a bad rap as some think they are made only as a springboard to a long-form project. She says she always knew she wanted to work in short form as it would focus her story and make the film easier to screen for organizations working with the physically and mentally challenged. Since traditional theatrical distribution is reserved for feature length documentaries (a form clearly not favored by Alice), filmmakers must search out non-traditional methods. She suggested that filmmakers should figure out their niche market then seek out avenues to that market like charitable organizations (as an educational/fund raising tool), libraries or schools. She formed some valuable, untraditional partnerships such as working with the Kiwanis Club, which has 8,000 chapters worldwide. She chose to work with a distribution collective that shares the expense of promotion through catalogue mailings, etc. She says when you know your audience you can be your own marketer. She cited the example of a woman who did a short doc on glass blowing that was shown at museums nationwide and grossed over $150,000. Alice says that when she has exhausted her own efforts and those generated from the collective she may consider working with a traditional distributor though the 70/30 split will be a hard pill to swallow. Her best advice: “Set your goals high.” When Sheila Nevins, the executive at HBO and CINEMAX in charge of documentary production, asked her what she wanted for this film, Alice thought a moment. She did not offer self-effacing, modest expectations such as, “ I just want my film to be seen”. She said experience has taught her to aim higher so she answered, “I want this film to win the Academy Award”, a dream she came very close to making a reality.